Why can’t you go home? Eric Carter, in Dead Things by Stephen Blackmoore, is about to find out. Eric heads home after he learns of the death of his sister. Finding out she was brutally murdered, he swears he will discover the identity of her killer. As a talented necromancer, he will make use of some of his talents to avenge his sister’s death. That is, if he doesn’t get himself killed first. Romance lovers be warned, this is a true urban fantasy. There are no goo goo eyes to be found in this story, but trust me, you don’t need them. Eric Carter is a great character, sarcastic and just screwed up enough that you have to like him. In addition, the supporting cast was super interesting. Some of my favorites are Darius, his bar and Santa Muerte. If that’s not enough, I also enjoyed many of Eric’s special talents. I would love to tell you more, but I just can’t bring myself to write spoilers. I will tell you this, I love, love , love the ending and can’t wait to read book two. 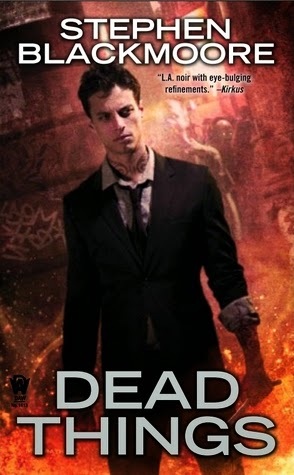 Dead Things is probably one of the best urban fantasy novels I’ve read in a long time. It definitely has the big three; great characters, great writing all wrapped up in a great story. Make sure to add it to your must read list and check back soon for a review of book two. Stephen Blackmoore is a pulp writer of little to no renown who once thought lighting things on fire was one of the best things a kid could do with his time. Until he discovered that eyebrows don't grow back very quickly. His first novel, a dark urban fantasy titled CITY OF THE LOST is out through DAW Books and is available at all the fashionable bookstores. Hopefully some of the seedier ones, too. He would, after all, like to buy a copy. His short stories and poetry have appeared in magazines like Plots With Guns, Needle, Spinetingler, and Thrilling Detective, as well as the anthologies UNCAGE ME and DEADLY TREATS. 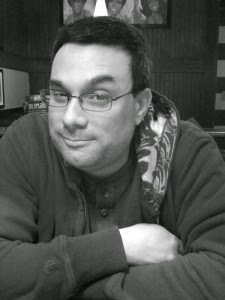 He is represented by Allan Guthrie at Jenny Brown Associates. Despite evidence to the contrary, he does not have rabies. The cover reminds of Keanu Reeves in Constantine so I'm looking forward to reading this book.